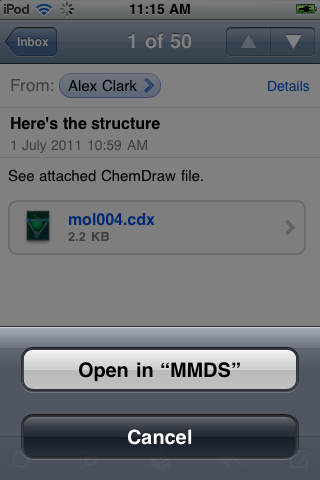 Version 1.2.9 of MMDS added a new attachment handler for ChemDraw (.cdx) files. This means if you open an email or a web URL that happens to have the extension “.cdx”, or the MIME type chemical/x-cdx, then MMDS will offer to open it for you, as shown in the screenshot above. Extracting the content from a ChemDraw file is not done within the app itself, but rather the task is farmed out to the molsync.com server as a remote procedure call, a capability that was introduced recently. 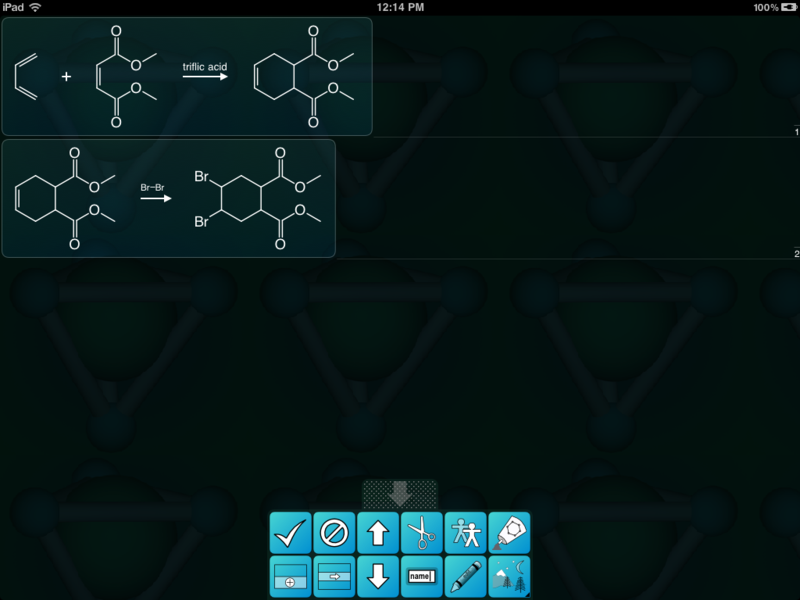 While MMDS and ChemDraw are both software applications designed around the drawing of chemical structure diagrams in 2D, they differ in more ways than just the platform and interface. ChemDraw is a fully fledged drawing package with numerous ways to annotate diagrams with the ultimate goal being a picture, while MMDS is based on a lean diet of pure cheminformatics. While these objectives may seem indistinguishable from a distance, it does mean that the feature sets are only a partial overlap, and interconverting the file formats requires a bit of creativity. Incoming ChemDraw files are interpreted as a single molecular structure by default, but if the document contains any reaction arrows, they will be interpreted and the result will be a reaction datasheet. This document has two steps; the first step involves two reactants, and both steps have a single reagent indicated, one of them being plain text, the other a structure. The detail view shows a reaction datasheet that contains two entries, one for each step of the reaction. 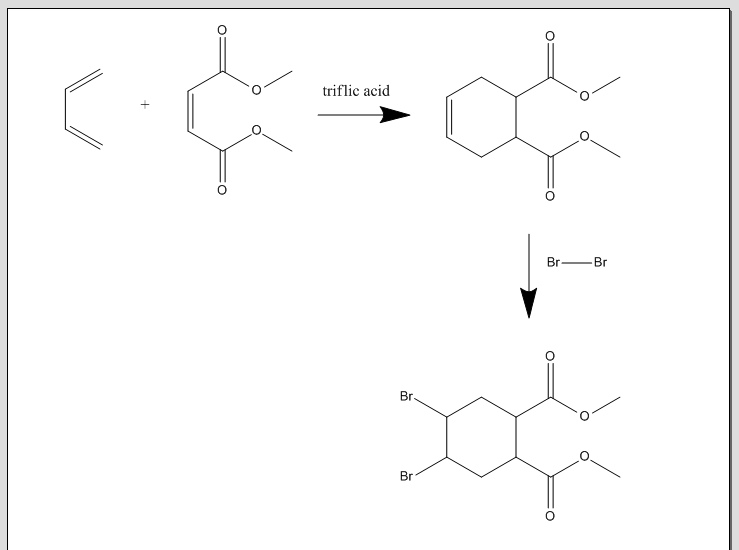 Notice that the intermediate product is the reactant for the second step, which is a logical transformation. When it comes to drawing individual molecular structures, ChemDraw has a lot of features that are not strictly relevant to cheminformatic representations of molecules, and have no equivalent within the datastructures used by MMDS. Others map quite well: for instance, the “dotted” bond type is converted into a zero–order bond; the various different visual styles of wedge bonds just fine; implicit hydrogen counts generally come through; and even the “nicknames” (e.g. “OMe”) are usually expanded out to contain their actual molecular representation. This is a new feature, and there are many ways in which it could work not quite as well as intended: so I encourage you to try it out, and if in doubt, send an inquiry to info@molmatinf.com. Preferably include the ChemDraw file, and either a screenshot or other representation (e.g. MDL MOL) version of how the file should have been imported.